But which hashtags should you use? What’s your hashtag strategy? Do you have one? The first step in creating a hashtag strategy is research. As a business Twitter user, you probably follow a few key hashtags. These are where you see the activity most relevant to you. But don’t get lulled into thinking these are the only ones or the most relevant ones. 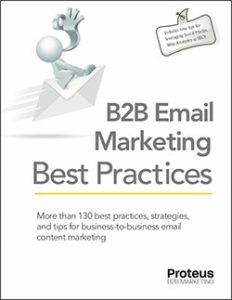 In B2B markets, there are generally many terms used for the same product or service. There are also many more people and parties involved in the buying process. Keep these factors in mind when researching hashtags. A good place to explore hashtags and their followers is wefollow. On the site, there is a search box at the top of the page. Start typing a few characters, and you’ll begin to see hashtags and the respective number of people who have registered at wefollow as following that hashtag. The more characters you type, the more refined your search becomes. Keep in mind, the actual number of people following a given hashtag will be more than those who have registered at wefollow. Select one of the hashtags shown in the search box drop-down, and you’ll be shown Twitter users following that hashtag. You can then scan users’ bios to see if those following that hashtag are relevant to your interests and whether that hashtag makes sense for you to use. If you click on a user, you’ll see what other hashtags the person follows. This is a great way to see what other relevant hashtags are out there. You can also choose to follow another user directly within wefollow; it will link up with your Twitter account. Once you’ve researched all the relevant hashtags, map them in terms of relevance and popularity. 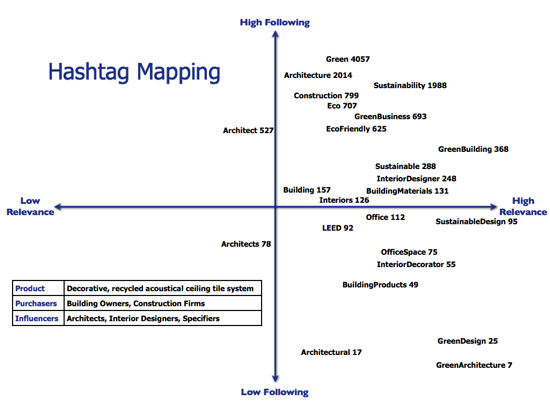 This will help you analyze, remember, and choose the most appropriate hashtags for your tweets. Below is an example of mapping hashtags. This fictitious company manufactures and sells decorative, recycled acoustical ceiling tiles used in commercial environments. While building owners and construction firms are the actual purchasers of the product, architects, interior designers, and specifiers strongly influence purchases. Each hashtag is mapped according to number of followers at wefollow and according to relevance. You will likely be tempted to use hashtags with a high number of followers. However, high following does not equal high relevance. Your tweets may be much more effective using niche hashtags. But niche hashtags have far fewer followers. How can you increase the awareness of these niches? One way is to pair highly followed, general hashtags with less-popular, niche-oriented hashtags. In doing so, you strengthen awareness of niche hashtags, increasing the likelihood that other may choose to follow and tweet with these hashtags. Another big benefit of pairing hastags in this way is that you’re also sending a signal to readers regarding the nature of content you’re tweeting, increasing the chance of click-through from those interested in this niche. Don’t mindlessly tweet the same thing using different hashtags. Before you write your tweet, keep in mind the hashtags you’re going to use. Use words and phrases relevant to people who follow those hashtags. It’s all too easy to send a tweet without hashtags or simply default to your favorites. Keep your hashtag map on your desk. It will help you remember other hashtags and be more strategic about which hashtags you use. It will likely also remind you to tweet the same content more than once using different hashtags, customizing your tweet to each audience. Don’t load up a single tweet with 4-5 hashtags. It looks like spam. Use 2-3 hashtags at most. Don’t use all 140 characters to get your hashtags in. Leave room for easy retweets. Where possible, use the hashtags in the body of your tweet instead of appending it to the end. It saves space. Love your tips! Was at a SM conference yesterday and not one of the speakers knew what you know about this stuff. Thanks for giving us all real methodology. Hi, Sean. Thanks for the compliment and for stopping by the blog and leaving a comment. While there is a lot of buzz concerning social media, boiling the noise down to a workable day-to-day strategy is sometimes hard to do. Glad you liked the tips. Good to know the way of putting the Hash tags in twitter. Using hashtags are a great idea. I am currently using one as a method of tracking contest entries. these tips are awesome, must give it a try! Great advice for small B2B companies wondering how to use Twitter and how to expand their reach.